^ Race Preview: 2015 Malaysian Grand Prix (PDF). FIA.com. Fédération Internationale de l'Automobile. [2015-05-31]. （原始内容 (PDF)存档于2015-05-31）. ^ 2.0 2.1 2015 Formula 1 Petronas Malaysia Grand Prix. Formula1.com. Formula One Administration. [2015-03-16]. （原始内容存档于2015-05-31）. ^ Malaysian Meteorological Department - Sepang. met.gov.my. Malaysian Meteorological Department. 2015-03-29 [2015-03-29]. （原始内容存档于2015-03-29）. ^ World Motor Sport Council 2014 – Beijing. FIA.com (Fédération Internationale de l'Automobile). 2014-09-12 [2015-03-01]. ^ World Motor Sport Council 2014 – Doha. FIA.com (Fédération Internationale de l'Automobile). 2014-12-03 [2015-03-01]. （原始内容存档于2015-03-19）. ^ A history of the Malaysian Grand Prix. ESPN F1 (ESPN Sports Media Ltd.). [2015-03-16]. 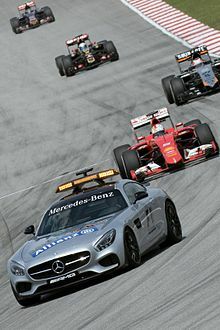 ^ F1: Sebastian Vettel wins the Malaysian Grand Prix - as it happened!. Guardian. 2015-03-29 [2015-03-31]. ^ Sebastian Vettel picks up surprise win for Ferrari to blow world title wide open. Daily Telegraph. 2015-03-29 [2015-03-31]. ^ 杨琳. F1马来西亚站维特尔夺冠 法拉利回勇车迷激动. 人民網. 2015-03-30 [2015-04-03]. ^ Lewis Hamilton and Mercedes dominance 'not healthy for F1'. Yahoo! Sport UK & Ireland. Eurosport. 2015-03-15 [2015-04-12]. （原始内容存档于2015-03-24）. ^ Are Mercedes making F1 boring? Rivals fear so. Gulf Times. 2015-03-15 [2015-04-12]. ^ Weaver, Paul. Red Bull’s Christian Horner asks FIA for help to save F1 season. guardian.co.uk. The Guardian. [2015-04-12]. ^ Edmondson, Laurence. Horner calls on FIA to rein in Mercedes. espn.co.uk. ESPN. 2015-03-15 [2015-04-12]. ^ 14.0 14.1 Brown, Oliver. Red Bull's threat to quit Formula One in face of Mercedes dominance leaves a sour taste. telegraph.co.uk. The Telegraph. 2015-03-18 [2015-04-12]. ^ Red Bull right to be upset by Mercedes dominance and something should be done, says F1 chief Bernie Ecclestone. telegraph.co.uk. The Telegraph. 2015-03-16 [2015-04-12]. ^ Parkes, Ian. Toto Wolff tells critics to Mercedes dominance to 'get your f*****g head down and work to sort it out'. dailymail.co.uk. Daily Mail. 2015-03-15 [2015-04-12]. ^ Weaver, Paul. Lewis Hamilton laughs off worries over dominant Mercedes ruining F1 season. guardian.co.uk. The Guardian. 2015-03-16 [2015-04-12]. ^ Weaver, Paul. Malaysia Grand Prix: floundering F1 chief has few answers to myriad problems. guardian.co.uk. The Guardian. 2015-03-27 [2015-04-12]. ^ Renault threaten to quit F1 following criticism of their engine by Red Bull. guardian.co.uk. The Guardian. 2015-03-27 [2015-04-12]. ^ Barretto, Lawrence. German Grand Prix officially cancelled from 2015 Formula 1 calendar. autosport.com. 2015-03-20 [2015-04-12]. ^ Collantine, Keith. Germany loses its F1 race – and Italy could be next. F1Fanatic. 2015-04-07 [2015-04-12]. ^ Collantine, Keith. Alonso’s race return confirmed by FIA. F1Fanatic. 2015-03-26 [2015-04-12]. ^ Bottas cleared to race. PlanetF1. 2015-03-26 [2015-04-16]. （原始内容存档于2015-04-16）. ^ Manor to race, Grosjean hit with penalty. PlanetF1. 2015-03-28 [2015-04-16]. （原始内容存档于2015-04-16）. ^ Baldwin, Alan. Manor to pay for failure, says Ecclestone. Reuters. 2015-03-16 [2015-04-12]. ^ Pirelli reveal tyre choices for first four races. Formula1.com (Formula One Administration). 2015-03-04 [2015-03-08]. ^ Weaver, Paul. Lewis Hamilton left frustrated after day of engine problems in Sepang. guardian.co.uk. The Guardian. 2015-03-27 [2015-04-12]. ^ 28.0 28.1 Collantine, Keith. Hamilton quickest at sweltering Sepang. F1Fanatic. 2015-03-27 [2015-04-12]. ^ Collantine, Keith. Rosberg leads the way as Hamilton fails to set at time. F1Fanatic. 27 March 2015 [12 April 2015]. ^ Ferrari junior Raffaele Marciello to get F1 practice run for Sauber. autosport.com. 2015-03-23 [2015-04-12]. ^ Collantine, Keith. Rosberg heads Hamilton in final practice. F1Fanatic. 2015-03-28 [2015-04-12]. ^ Practice and qualifying. FIA. [2015-06-21]. ^ Collantine, Keith. "Not again!" Hamilton pips Vettel to Malaysia pole. F1Fanatic. 2015-03-28 [2015-04-12]. ^ Romain Grosjean handed two-place grid penalty. Autosport (Haymarket Publications). 2015-03-28 [2015-04-06]. ^ Collantine, Keith. Vettel has a better chance to race Mercedes this time. F1Fanatic. 2015-03-28 [2015-04-12]. ^ Collantine, Keith. Early start time to reduce risk of rain delay. F1Fanatic. 2015-03-26 [2015-04-12]. ^ Collantine, Keith. Williams still off the pace in wet conditions – Massa. F1Fanatic. 2015-03-28 [2015-04-12]. ^ Collantine, Keith. Stevens will not start Malaysian Grand Prix. F1Fanatic. 2015-03-29 [2015-04-12]. ^ Daniil Kvyat continues after being hit by Nico Hulkenberg in Malaysia. bbc.com. 2015-03-29 [2015-08-05]. ^ Smith, Alan. F1: Sebastian Vettel wins the Malaysian Grand Prix - as it happened!. guardian.co.uk. The Guardian. 2015-03-29 [2015-04-12]. ^ Weaver, Paul. Sebastian Vettel moved to tears in Malaysia by his first F1 win for Ferrari. guardian.co.uk. The Guardian. 2015-03-29 [2015-04-12]. ^ 42.0 42.1 42.2 2015 Malaysian Grand Prix - Sunday Post Race Press Conference. FIA. 2015-03-29 [2015-04-12]. ^ Cushnan, David. F1 Business Diary 2015: the Malaysian Grand Prix. sportspromedia.com. 2015-03-30 [2015-04-12]. ^ Maurizio Arrivabene broke down and cried after text from Michael Schumacher's family. espn.co.uk. ESPN. 2015-04-02 [2015-04-12]. ^ Sebastian Vettel cools talk of equalling Ayrton Senna's win record in Shanghai. thenational.ae. 2015-04-09 [2015-04-12]. ^ Hofmann, René. Sport schlägt Show. sueddeutsche.de. Süddeutsche Zeitung. 2015-03-29 [2015-04-12]. ^ McEvoy, Jonathan. Sebastian Vettel strikes back as Ferrari driver wins Malaysian Grand Prix with Lewis Hamilton left venting fury at his team. Daily Mail. 2015-03-29 [2015-04-12]. ^ Force India unimpressed with Manor no-show. crash.net. 2015-04-01 [2015-04-12]. ^ Manor reject one-car claims. planetf1.com. PlanetF1. 2015-04-01 [2015-04-12]. （原始内容存档于2015-04-12）. ^ Verstappen adds another record to his teen years with first F1 points at Sepang. themalaymailonline.com (Malay Mail). 2015-03-29 [2015-08-06]. ^ Record-breaker Max: It was a good day. planetf1.com. PlanetF1. 2015-03-29 [2015-04-12]. （原始内容存档于2015-04-12）. ^ 2015 Formula 1 Petronas Malaysia Grand Prix - Qualifying results. Formula1.com. Formula One Administration. 2015-03-28 [2015-03-28]. ^ 2015 Malaysian Grand Prix - Stewards' decisions document 24 (PDF). FIA.com (Fédération Internationale de l'Automobile). 2015-03-28 [2015-03-28]. ^ Marussia drivers granted permission to start in Malaysia. 2015-03-28 [2015-03-28]. ^ 2015 Formula 1 Petronas Malaysia Grand Prix - Race results. Formula1.com. Formula One Administration. 2015-03-29 [2015-03-29].